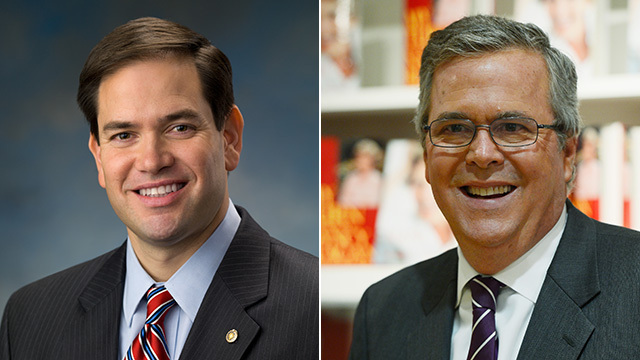 Marco Rubio, left, and Jeb Bush, right, will appear on "This Week". A rush transcript of "This Week with George Stephanopoulos" airing on Sunday morning, June 16, 2013 on ABC News is below. This copy may not be in its final form and may be updated. KARL: Good morning, and welcome to This Week. Crossing the red line, President Obama signs off on arms to the Syrian rebels. PAUL: I want to know what the end game is. KARL: Is he going too far? MCCAIN: Just to provide additional weapons is not enough. KARL: Or is it too little, too late. And? OBAMA: Congress needs to act. And that moment is now. KARL: The battle over immigration reform. Will it pass? This morning, a key player in both debates, Senator Marco Rubio, a This Week exclusive. Then, all of the weeks politics. ALEXANDER: We aren't trying to hide it. We're trying to protect America. KARL: More scrutiny over surveillance. And? KARL: Iran's surprising pick for president. Plus, another exclusive. BUSH: He's the best dad, and the best man I've ever met. KARL: Jeb Bush, in our Father's Day Sunday Spotlight. ANNOUNCER: From ABC News, This Week with George Stephanopoulos. Reporting from Washington, Jonathan Karl. KARL: Hello again. George is off. It is great to have you with us. Is the U.S. about to get involved in yet another war in the Middle East? After determining that Syria's government did in fact use chemical weapons, crossing President Obama's red line, the White House has made a decision to send arms to the Syrian rebels. Many in Congress have been pushing for more action, including our first guest, Florida Republican Senator Marco Rubio, who joins us now from Miami. Good morning, Senator, and happy Father's Day. RUBIO: Good morning, happy Father's Day to you and all your viewers. KARL: Thank you. so you have been pushing for a long time for the U.S. to arm the rebels. Is this going to make a difference? RUBIO: Well, let me just say that in politics or in foreign policy, timing matters. So these were options that were there for us a year and a half ago, before this thing kind of became this chaotic. It behooved us to kind of identify whether there were any elements there within Syria fighting against Assad that we could work with, reasonable people that wouldn't carry out human rights violations, and could be part of building a new Syria. We failed to do that. This president failed to do that. So now your options are quite limited. Now the strongest groups fighting against Assad, unfortunately, are al Qaeda-linked elements. That doesn't mean that they all are, but it certainly -- this group has become the most organized, the best armed, the best equipped. Our options are now really narrower than they were a few months ago. So look, I think we should continue to search to see if there are any elements fighting against Assad that are reasonable, that we can work with, that will respect human rights and hopefully build a new Syria. I just think it's a lot tougher now when you've got Hezbollah running around and Russia fully arming Syria, and Iran fully engaged in this as well. I think that the fact that it's taken this White House and this president so long to get a clear and concise policy on Syria has led us -- has left us with the worst possible scenario right now. KARL: OK, so we're here now though. What would President Rubio do right now? Would you commit U.S. forces to -- to a no-fly zone? RUBIO: First of all, if I was in charge of this issue, we never would have gotten to this point. We would have identified elements that we could have worked with, and we would have made sure that those elements, not the al Qaeda elements, were the best armed, best equipped and best trained. That being said, I think we need to continue to search for elements on the ground that we can work with, and we should try to do the best we can to increase their viability and their strength so that even when Assad falls, and we hope that he still will, they will be the ones on the ground with -- with the best ability to kind of manage a future, hopefully democratic Syria, and peaceful Syria. KARL: Before we leave the Middle East, we obviously had a big election in Iran over the weekend. The most moderate candidate won. So let -- let me ask you this, is Iran under a President Rohani going to be potentially easier to deal with? Less of a threat than Iran under President Ahmadinejad? RUBIO: First of all, moderate from -- by Iranian political standards is not what we could describe as moderate here in the West, but let me just say that I hope so, because the people of Iran do not want the future that their leaders have wanted. The people of Iran want to engage with the rest of the world, do not want to be isolated, don't want Iran going back to the 16th and 17th century. They'd like to be part of the 21st century. The people of Iran, and hopefully this will be a step in that direction. But I'm not all that optimistic. At the end of the day, in order to have better relations, not just with the United States but with the world, Iran knows exactly what it needs to do. It needs to abandon its nuclear weapons ambitions, and it needs to pledge to walk away from these things. And unfortunately, this gentleman who was just elected is a strong supporter of the nuclear program and the nuclear weaponization as well. And so the bottom line is that that we are hopeful that that's the case, but at the end of the day, you know, the supreme leader calls the shots in Iran, and it's still the same supreme leader that has put Iran on this very dangerous track. KARL: OK, I want to turn to immigration. You are one of the primary architects, author of the bill that came out of the Senate Judiciary Committee, immigration reform. I have a basic question for you, Senator. Do you support your own bill? RUBIO: Well, obviously, I think it's an excellent starting point, and I think 95, 96 percent of the bill is in perfect shape and ready to go. But there are elements that need to be improved. This is how the legislative process is supposed to work. You offer an idea, you get public input and the input of your other colleagues. From these criticisms or observations come out new ideas about how to make it better, and of course you can't ignore that. Those things need to be addressed. And we have the opportunity to do that now, in particular on the border security element. Look, the vast majority of Americans, the vast majority of conservative Republicans are prepared to support immigration reform, but only if we can ensure that we're not going to have another wave of illegal immigration in the future. And so I think they have pointed to valid criticisms of how the border security plan is structured in the bill, and quite frankly very reasonable ways to address it. KARL: If the bill stays as it is regarding border security, do you vote for it? KARL: It's a very real possibility, Senator. RUBIO: Well, no, it's -- don't think it is. Because the bottom line is a bill that does not have increased border security, which everyone now I think has conceded needs to happen -- I think the debate now is about what that border security provision looks like. And if we do that, this bill will have strong bipartisan support. If we fail, we're going to keep trying, because at the end of the day, the only way we're going to pass an immigration reform law out of the House and Senate so the president can sign it is, that it has real border security measures within it. RUBIO: Well, I think it is important to remember that on virtually every other issue, I agree with many of the folks that right now are just not supportive of the immigration reform bill. I understand why they are opposed to it. I really do. I mean, we have the most generous country in the history of the world, whose immigration laws have been taken advantage of. You have an administration claiming that there is no problem, that the borders are already secure, when everyone knows they're not, and people are frustrated by this. And to top it all off, when you mention any of these things, you are accused of being anti-immigrant or anti-Hispanic. KARL: But directly answer that question. Are you being played by the Democrats? Is Chuck Schumer playing you, is essentially the charge? KARL: Is he using you? Is he using you to try to accomplish something that the Democrats want and is not -- not a conservative bill? RUBIO: Immigration reform is something that all Americans recognize has to be done. I mean, I don't focus a lot on public polling, but if you look at these public polls, it's clear the vast majority of Americans understand that what we have in place in this country is de facto amnesty, a broken legal immigration system that needs to be reformed. KARL: The president came out this week and he gave one of his first speeches on immigration in a -- in quite some time. I'm wondering, do you consider that helpful? Is it helpful when the president comes out as he did and, is harshly critical of the critics of this bill? RUBIO: Well listen, I think the president has his hands full these days. I didn't quite frankly even hear the speech. We were very busy this week. I -- I think I read some headlines here or there, but obviously the president -- we're -- our job as legislators, you know, as members of Congress, is to pass legislation. And that's what I hope we'll do out of the Senate, and then the House will have its work, and we'll work together to try to solve this problem. And then the president will have a decision to make about whether he wants to sign the bill or not. KARL: All right, before we go, I've got to ask you about the Miami Heat. Series tied at two. Does LeBron James have to deliver a championship to Miami to be considered -- even considered to be in the same league as Michael Jordan? KARL: Yes, I believe so, yes. RUBIO: Oh, good. Listen, LeBron James is one of the -- is certainly the greatest player in the world right now and one of the greatest players of all time, and I think by the time his career is over, that will be evident to all. I -- I expect him to win. I predicted that they'll win this series in six games. I stick by that prediction. They will win tonight in San Antonio, and then they'll wrap up the series on Tuesday night here in Miami, on ABC. I think the pre-game coverage begins at 8:30, if I'm not mistaken. KARL: Yeah. That's 8:30 Eastern. Thank you very much, Senator Rubio, I appreciate it. KARL: We invited the White House to send a representative to discuss the new policy on Syria, but they declined. Now to talk more about the next steps for the U.S., we're joined by George Will, Jeffrey Goldberg of The Atlantic, Jeremy Bash, former chief of staff to both the CIA director, and the secretary of Defense, and my colleague, ABCs Chief Global Affairs Correspondent, Martha Raddatz. George, not long ago you said the president is right on Syria. Now what? WILL: Now he's wrong. Two axioms from two great military leaders. Napoleon said, if you start to take Vienna, take Vienna. That is don't be tentative, whatever else you do. And don't be tardy. General MacArthur said, every military debacle can be explained by two words, too late. Too late to discern the threat, to prepare for the threat, to respond to the threat. This intervention in another nation's civil war with sectarian overlays and ethnic complications was announced not by the president, not in conjunction with congress, it was announced by the deputy national security adviser. This is obviously a reluctant president who now has himself in a competition with the Russians who are all in supporting the other side. We want to have negotiations. We're not neutral. The president has said Assad lacks legitimacy and Assad must go. So, the negotiations are to negotiate Assad's departure from power, I don't think he's interested. KARL: OK. You're saying the president is wrong, because you didn't think we should get in there. Jeffrey, you've been for a long time saying that the administration, that the U.S. needs to get involved, needs to arm the rebels and do more, now? GOLDBERG: I agree with George, this is the worst of all possible worlds. This is dipping a toe in. This is signaling we're in, but not really in. No one believes, including the president, I believe, no one believes that these small arms are going to change the balance of this war. I don't think Hezbollah, I don't think the Iranians are sitting there going, oh look, the Americans are sending eight trucks of small weapons to the rebels, we better give up. So, what I'm saying is, either be in or be out, but don't play around in this. I think that we're going to find that we might be on the slippery slope. And I happen to agree that it might be too late. We're not in a position to intervene in what has become a Hezbollah-al Qaeda war. And I don't know the answer to who do you support in that. I think neither party is the party you support. KARL: Well, Jeremy, you're just out of the administration. You were at the Pentagon when a lot of these deliberations were going on. We know -- what seems like a long time ago now, Secretary Panetta, Petraeus who was CIA director at the time, Hillary Clinton, secretary of state, all made the case for arming the rebels. That was a long time ago. Is it too late? BASH: Well, John, two things have changed in recent weeks. First, the intelligence community came forward with a comprehensive assessment that said they have high confidence that Assad used sarin gas, chemical weapons to kill 100-150 of his own people. BASH: Assad didn't just walk up to the red line, look both ways, and tip-toe across. He barreled across the red line. We set the red line, and now the president has determined we have to act. And second, three weeks ago, Hezbollah announced that they are going to join this fight and fight on Syria's behalf to the death. Now I have been in these rooms, Jon when these issues have been discussed. The president is not hesitant to order military forces into harm's way. He did it in Afghanistan, he did it in Libya and he did it deep into Pakistan to get Osama bin Laden. KARL: But he has been reluctant on this. BASH: But he's been careful. What he wants to ensure is that our military objectives meet a strategy. And now is the right time to arm the rebels. RADDATZ: I'm not sure I how what the strategy is and how those two match. Because the small arms are frankly not going to do much good at all. They may not do any harm, but they're not going to do much good. It will not change the balance there. If the president really wants to make a difference there, and you talk about military force, I doubt he's going to send in boots on the ground ever, and they've made that very clear. But if we are in, and it really does appear we're on a slide in, you really can't put your toe in the water on something like this, you now own, even if it's just a toe, you own part of that. If you want to make a bigger difference, they have to look at a no-fly zone. Now, they're going to leave F-16s behind, they're going to leave PATRIOT missile batteries behind in Jordan after some U.S. military exercises that are taking place over there. A no-fly zone would be a very big deal. We talk about the number of casualties over there and that very few of them are from air strikes, but because Assad has air power, because he has the mobility, because he can resupply his troops, because he can move his troops around by air, he has a huge advantage. Will the United States do that next, will someone else do that next? We don't know. But that would probably be a huge game changer. Because if you want a war of attrition, and you don't have air power and you don't have protections against air power, you're going to lose. BASH: Of course, these are imperfect options. Thank you for pointing that out. We understand that. That's why this has been very difficult. But when you're in that room hearing the arguments on both sides, and you see the evidence, the concrete evidence that he used chemical weapons, you have to act. RADDATZ: But was it really about chemical weapons? There was more to it than that. First of all, Assad's forces are much, much stronger now. And in the last few months, they have really started to take back areas. WILL: The Washington Post reported this week that this decision to intervene was made before the conclusion came -- was arrived at about chemical weapons. Second, even if they did use chemical weapons to kill one traction of 1 percent of the 93,000 that have been killed there, how does that change our national interest? George W. Bush undertook two exercises in regime change in Iraq and afghanistan. Libya now, followed by Syria, two regime change exercises by the Obama administration. And there's no denying that regime change has to be the outcome here, which is why poor John Kerry, the secretary of state, is out there trying to get a conference together as though there's a congruence of interest between the Russians and United States. There isn't. We're on opposite sides. RADDATZ: And we know that more than ever right now, because of this. GOLDBERG: One of the reason that a lot of people like me who were hawkish I think early on are less hawkish now is because this problem might have become too big for any country to handle. I mean, let's look at Iraq. I mean, you're talking about a global Shia-Sunni conflict playing out on the Syrian battlefield. You're talking about Hezbollah and al-Qaeda battling it out on the Syrian battlefield. How do we interpose ourselves into that? A no-fly zone? A no-fly zone is not going to be enough. BASH: All the more reason why we just can't stand back. We have to engage. The goal is to change the balance of power on the battlefield. You know, there's a lot to talk about no-fly zones and air strikes, 95 percent of the casualties have been from ground operations. We have to give the opposition, which is now better organized under General Idriss more of a chance to take it to the Assad regime. RADDATZ: So heavier weapons? I mean, do you give them heavier weapons, because you're not going to change the balance with small arms. BASH: Direct military support. That's the key. KARL: Even these small arms are going to take months to get there. Hey, we're almost out of time. I've got to ask about, Jeffrey, the elections in Iran. Does this change the calculus at all? We now have a so-called moderate being elected president. GOLDBERG: Look, this is a fake election and a fake democracy. Let's not kid ourselves about what we're dealing with here. These are hand-picked candidates by the supreme leader who are running for president. That said, this guy is a smoother operator. He does seem more moderate in his economic approach. He does seem less confrontational. But remember, the leader of Iran is the supreme leader. I mean, they call him supreme leader for a reason. It's a nice title, right? He's the supreme leader. He sets national security policy. He sets foreign policy. He sets nuclear policy. So let's not forget where the power lies in that country. KARL: OK. Just one more thing, Jeremy because you're here, I've got to ask about the NSA and the search for Edward Snowden. Take a look at what he said to the China Morning Post. He said people think I made a mistake in picking Hong Kong as a location, misunderstand my intentions. I am not here to hide from justice, I am here to reveal criminality. How worried is the intelligence community that he is effectively going to defect to China or China will get ahold of whatever else he has? BASH: Very, very worried. Every day he's in China, Jon, I think erodes his claim that he's a whistleblower. The information he has in his head and maybe on his person or on his computer or on his thumb drive is very valuable to the Chinese. They're very interested in it. If they haven't exploited it already, I suspect they soon will be. KARL: All right. Unfortunately, we're out of time. Martha, Jeremy, Jeffery, George, thank you very much for joining us. Thanks everyone. Coming up next, George will join out powerhouse round table. We'll discuss new revelations about the government's secret surveillance programs, plus is immigration reform in trouble? We're back in 90 seconds. BARACK OBAMA, PRESIDENT OF THE UNITED STATES: What was true years ago is still true today. OBAMA: You're feeling kind of self-conscious, aren't you? It's OK.
KARL: A lighter moment from the president's big speech on immigration. We'll get to that in a moment. But first the "Roundtable" is here. We have George back with us, along with Democratic strategist Donna Brazile, Democratic Congressman Luis Gutierrez, and former Speaker of the House Newt Gingrich. So I want to start with Syria. The president made this decision now to arm the rebels. It came after we heard Bill Clinton weigh in on this. Clinton saying, some people say, OK, see what a big mess it is, stay out, I think that's a big mistake. In fact, the former president suggested that President Obama could be a fool if he were to not get in because of public opposition to our involvement. Did Bill Clinton force the president's hand? BRAZILE: Oh, I don't think so. Look, I think the administration was already on a two-track strategy. One to arm the opposition, and I think second is to work toward a political solution to get Assad out of office. We're spending over $500 million in humanitarian aid, there's a refugee problem in Turkey and Syria. There's no question the administration had to circle the wagon to make sure that they were arming the quote-unquote, "right people." But the administration I believe cautiously decided that it was time to change the political trajectory of what was going on on the ground, and therefore they're going to supply the so-called rebels with some arms. GINGRICH: This is an administration that does almost nothing that is methodical, careful, and professional in national security. I mean, they don't take the advice of the generals. They don't take the advice of any -- if you were to say to them, what is it going to take to knock Assad out, that is a huge undertaking. He now has Iranian backing, Russian backing. He has Hezbollah coming in because he couldn't win on his own. KARL: Well, in this case we don't see the generals pushing for that at all. In fact, as we understand it, the generals oppose even a no-fly zone. GINGRICH: But the generals -- because it's all nonsense. I mean, what are you going to accomplish? If the Iranians and the Russians are prepared to arm and equip and support Assad, and if Hezbollah, and by the way, Iranian volunteers, are prepared to help kill Syrians for Assad, then the idea that we're going to somehow marginally affect this is a disaster, I think. And this will turn out to be one of those cases where the United States will set itself up to be defeated, and Putin will be quite happy on behalf of Russia to be part of defeating the United States. I think it's a very badly thought-out process. KARL: Congressman, are you comfortable with how the president is handling this? GUTIERREZ: Well, I don't think there's a good solution. So I don't know if "comfortable with how the president is handling it" is -- I really have an opinion. I just think there really isn't a good solution there. GUTIERREZ: And you talk to -- here's what they're going to tell you. The best-equipped, the best-organized fighters are those allied with al Qaeda. And those are the ones that are really fighting Assad. KARL: And now we're going to arm the opposition. GUTIERREZ: And so now we're trying to make a decision who is it we're going to arm? Here's what can happen, and I think it would be the worst scenario, is that we do arm our proxies, our good rebels, and then the al Qaeda start fighting the American proxy good rebels. And you know what Assad says to himself, great, I now have split my opposition. So, look, if you take Iraq, we saw what happened in Iraq. We had, what, 150,000 American men and women there and during that time, over 300,000 Iraqis died in the ensuing civil war. What makes you think that our involvement is somehow going to solve the problem? So what I say is, look, we really need a diplomatic solution, and it seems to me that the only place we can move today is to force the hands with Russia and with Putin to find a solution that can end the Assad regime. KARL: George, I don't hear anybody thrilled with this. WILL: Well, then the policy should be just don't do something, stand there, because you can always make matters worse. The administration says we're going to get our weapons into the right hands. The Hamiltonians, the Jeffersonians, the Federalists, the Anti-Federalists, the Whigs, fine, let's arm them all. But they're not over there. We don't have people like that there. The secretary general of the U.N., always helpful, weighs in with the sentiment, he said, there's no military solution to this. There was a military solution to the American Civil War, the Russian Civil War, the Spanish Civil War, there's going to be a military solution to this, someone is going to win. And Assad has backers who mean it. Our side, whatever it is, doesn't. GUTIERREZ: ... what we kept hearing was the Assad regime is on the brink of collapse. For two years we have been hearing this. There is absolutely no indication that he isn't -- and his regime, isn't becoming stronger, that it does not have popular support within Syria, in spite of the fact -- this is a civil war. BRAZILE: But they're looking for a political solution. They're not looking for a military solution. GUTIERREZ: We need a political solution. BRAZILE: This is a political solution. BRAZILE: They're trying to bring Assad, you know, to the table to get him to go away. WILL: The table that will end this war would be that the one in the kitchen of the McLean farm at Appomattox, someone is going to surrender. GUTIERREZ: I think that economic sanctions can work here. BRAZILE: Yes, he has Iranians and Russians. GINGRICH: He has Iranian and Russian money. And I just want to build on what George said. In the Spanish Civil War, the democracies ineffectively tried to help one side. The dictatorships effectively tried to help the other side. Military power, ruthlessness, and toughness matters in these kinds of settings. Virtually all of it now is on Assad's side. And I think the United States proving that it is incapable of being effective will not be a particularly good strategy. KARL: OK. I want to turn to immigration, because we heard from Marco Rubio on this, a very critical week for the immigration bill. We also heard from Speaker of the House John Boehner, interview with George Will (sic). Take a listen. GEORGE STEPHANOPOULOS, HOST, "THIS WEEK": What's the most important thing you'll get done this year? REP. JOHN BOEHNER (R-OH), HOUSE SPEAKER: I think immigration reform is probably at the top of that list. STEPHANOPOULOS: One that passes the House, passes the Senate, signed by the president? KARL: Well, Mr. Speaker, the big question here is will John Boehner, should John Boehner go forward with a bill that does not have the support of the majority of Republicans? GINGRICH: No. And I don't think he will. I think John Boehner will find a way to get a majority of Republicans and find a way to get a majority of Democrats, and there will be a more conservative bill than the Senate, and it will be a bill that is stronger on border security than the Senate. KARL: You really think a majority of Republicans are going to sign on to a bill that includes a path to citizenship? GINGRICH: Sure, depending on how long the path is and what the circumstances are, yes. I think -- look, people -- most people have two general beliefs, one is that you have got to do something when you have 11 million people who are currently outside the legal system. The other is you have got to control the future. And that means you have got to control the border and you've got to have some kind of employment system that includes guest workers or you're just going to kid yourself, and 10 years from now be back on the same thing. I think Boehner has been very careful. And he's not going to carry everybody. But I think he will carry a majority of the House Republican Conference or he won't bring a bill to the floor. KARL: Congressman Gutierrez, I have heard that you're going to meet -- you and the Democrats -- Hispanic Democrats in the House are going to meet with the speaker this week. GUTIERREZ: Yes, and I think that that's a wonderful opportunity to engage in bipartisanship. KARL: Do you think he's serious? GUTIERREZ: I have been in Congress 20 years. This is the first time that I know 25, 30 Democrats, members of the Hispanic Congressional Caucus, under the leadership of Ruben Hinojosa, have gone to the speaker, a speaker not of our party, and said, we want to engage you in a conversation because we're looking for a solution. What I would hope is that Speaker Boehner will embrace our coming to him and that we can work collectively. Because, look, this cannot be a partisan issue. Look, you can talk about Benghazi, and we can talk about Syria, we can talk about Obamacare and its implementation, let's not let this issue, the one issue in which we have seen Republicans and Democrats come together, fall into the morass of the bickering and the fighting here in Washington, D.C. I want to say it's Father's Day, right? A study just came out this week in Illinois, 56,000 children were left without a mom or a dad, some without parents in the last six years. It's something we have to answer. It's a tragedy, what's happening to American immigrant families. BRAZILE: If this bill is not pulled to the right in the House, we saw what Steve King did with the DREAM Act. This is a major test of whether or not our political system can get real things done. And I do believe with the bipartisan support that we have seen in the Senate, that there's a chance, if all of these poison pills are not placed in its path, that we could see a path to getting this done this year, immigration reform. WILL: Donna uses the word "poison pill" to describe probably Cornyn's amendment. Now Cornyn has an amendment, it is 134 pages long, to a bill that's, what, 800 and some pages long? KARL: Eight hundred and some pages, yes. WILL: Well, it's long because -- the bill itself is because there are provisions in it, for example, special exemptions for foreign ski instructors. WILL: At the behest of the good senator from Colorado. This is a very complicated Rubik's Cube they've put together. And it comes down to the killer Bs, benefits and borders. If you don't secure the borders, you're not going to pass either house. GUTIERREZ: And what I think is the following, look, how do you secure the border? I think we know. And there's a bipartisan way to secure the border. Securing the border means you have to allow people to come through the system. That releases the stress on the border. Number two, you need to legalize the 11 million that are here so we stop deporting them and they continue to try to come back to their American-citizen children. And, lastly, think about it, they keep talking about the magnet, E-Verify. Let's have a verification system for employment in America that makes sure that those of us born in this country get the first crack at any job created in this country so that we stop it. But it can't be just that border. That border has many other competing interests that keep it secure or unsecure. WILL: The question of border security is now tangled up with the IRS and the Justice Department, and the general pervasive distrust of the executive branch. Because what the bill says is, the executive branch will certify if the border is secure. I don't believe that the Republicans in Congress are going to take that. They're going to say -- they're going to vote for a bill or against a bill, whether or not it has Congress shall certify, not the executive branch, because no one trusts the executive branch anymore. KARL: Donna, how much further are Democrats willing to move on this? BRAZILE: I don't think Democrats -- I mean, look, Chuck Schumer said he's looking for an answer. So he's working with John McCain and the other members of the gang, this is the only show where I can talk about gangs, to try to find a solution to the 1,969 miles of the border. KARL: We have got to take a quick break. More of our "Roundtable" straight ahead as Chris Christie shares the spotlight with yet another high profile Democrat. Will it help or hurt if he runs for president in 2016? KARL: More roundtable next. But first, it was John Oliver's first week subbing on "The Daily Show," and he started off by sharing a special note that Jon Stewart left him. Check it out. JOHN OLIVER, HOST, DAILY SHOW: A little note and it says, "don't worry, you'll be great." That's nice. Although, subjective. "Besides, no good news stories ever break out over the summer." WOLF BLITZER, CNN ANCHOR: U.S. officials acknowledged that intelligence agencies are secretly collecting millions of Americans' phone records on a daily basis. OLIVER: Jon's been gone one day! One day! GOV. CHRIS CHRISTIE, R-N.J.: What we don't need is another unelected politician just sitting around the Congress, whether it's in the Senate or the House of Representatives. JIMMY FALLON, TALK SHOW HOST: Take it from the man, the love gov. When he sits around the House of Representatives, he really sits around the House of Representatives. KARL: Chris Christie clearly enjoying the spotlight this week. First he was there with Jimmy Fallon, and then on Friday sharing the stage with President Bill Clinton in Chicago. And of course, he was recently seen high-fiving another Democratic president on the Jersey shore. So my question to you, Speaker Gingrich, as someone who's been through the Republican primaries, are Republican voters going to forgive all this if he decides to run for president in 2016? KARL: You know people are going to see him high-fiving Barack Obama. GINGRICH: Because it won't matter. Look, the average American is so sick of the petty negativity. He says, look, I was governor of New Jersey. I did everything I could to help the state of New Jersey, and when I get to Washington, I'm going to do everything I can to help America. And if you want somebody too stupid to help their state, I'm sure you'll find one of my opponents more acceptable. KARL: So, George, I just saw a fascinating series of polls here on Christie. Gallup has got some numbers, looking at the Republican field. Chris Christie is the only Republican probably in the world who has a positive favorable rating among both Republicans and Democrats. He is over 50 percent among both. WILL: His message is his persona. His persona is I'm the I don't give a damn politician. I'm going to be what I am, get over it. I'm large. I'm loud. Accept me. But he's going to say, look, I can carry a blue state. There are 18 states plus the District of Columbia have voted Democratic in six straight elections. They've got, what, 244 electoral votes, something like that. Democrat starts out looking for 26 electoral votes. Christie's argument to the Republicans is going to be you need someone who can flip some blue states. And I'm the one who can do it. BRAZILE: I love the slow jam, by the way, with Jimmy Fallon. And he has a good voice. But he's looking at -- Chis Christie is looking at two calendars, the political calendar of 2013, which involves his own re-election, and of course the special election. He has to show that he can win a significant amount of votes, I mean, 57, 58, 59 percent. And right now the polls suggest that he's leading his opponent. And then of course he can look at 2016 a couple of months from now. But there's no question that that bromance that you saw between Chris Christie and Bill Clinton, that is real. It's real, because they found common ground on issues that matter to most Americans. KARL: You know, we also saw Hillary Clinton about -- a little before we saw Chris Christie on the on the stage with the Bill enter the world of Twitter. Now take a look at her bio, take a look at this thing. Talks about, she's "a wife, a mom, lawyer, et cetera, et cetera, and TBD." Donna, you know the Clintons as well as anybody, was that basically a declaration of candidacy? BRAZILE: Whether she runs or not run, what she did this week was first of all began to talk about things that matter to her. Her life-long passion for childhood education, working on economic development for women. She's going to be a presence whether we know her intentions for 2016 or not. By the way, she got more followers in one day than Charlie Sheen. And that's impressive on Twitter. George you need to get on Twitter soon. I'm sure you'll have followers. KARL: And if she does, does it clear the field? GUTIERREZ: I hope it does. I think she'd make a fabulous candidate, nominee for the Democratic Party and a wonderful president of the United States. And going back, speaker, I think you're absolutely right about Chris Christie. You know, the cemetery is filled with politicians who wanted -- always looking for the next job, that next position without securing the one they have. And I think he's securing the one he has so that he might be in a position to get one in the future that is president of the United States. And wouldn't it be wonderful if all of us, if I, if every Democrat and every Republican as we stand for re-election, had to be concerned about the other party and maybe there would be more bipartisanship. KARL: OK, we have a couple of more minutes left. I want to get to the other political story this week, Mayor Bloomberg, his anti -- his pro-gun control group, is now up on ads in four states targeting Democrats, Donna. He's going after Democrats who voted against the background check bill. This did not sit well with Senator Chuck Schumer, who said, frankly, I don't think Bloomberg's ads are effective. The mayor of New York City putting ads against people in Red States is not going to be effective. What do you think? You want him out there targeting Democrats? BRAZILE: Look, on one hand he's trying to level the playing field. The NRA spends buckets of money and you know giving resources to pro-gun candidates. What he's trying to do is top identify candidates that he might be able to flip if we have another vote. I don't know if he will flip Mark Pryor. I don't think he can flip Heidi Heitkamp. I believe what he's trying to do, again, is to put his money where his passions lie, but it's not the right strategy to tell Democratic donors not to support members like Pryor, Landrieu, Hagan, and others who are quite vulnerable. KARL: George, you don't agree with the mayor on guns, but you probably don't mind seeing him out there with these ads. WILL: Go get them. I'm all for this. And if, by the way, and Michael Bloomberg from New York City flips someone from Dakota territory or from Arkansas, it's not going to do them any good getting reelected up there. And by the way, I'm from Louisiana. And Huey Long would have relished an idea of a New York Mayor coming down to Louisiana telling him how to vote, you know, on guns of all issues. KARL: Your thoughts on Bloomberg? GINGRICH: I think what this illustrates is why you need to drop all of the efforts to micromanage politics at the candidate level. I have no problem with him spending the money as free speech. But then the candidate he's attacking should be allowed to raise the same quantity of money. Today, you have a very tight limit on what the candidate can raise. And these billionaires on both sides, right and left, come in with enormous amounts of money in a way that's clearly bad -- just bad for the long-term representative self-government. GUTIERREZ: It's almost like shame on him for being consistent, right, consistently against guns that he believes, and that I share his belief, cause incredible damage throughout the United States. KARL: But you don't want him attacking Democrats? GUTIERREZ: Well, I think everyone has to fear the fact that their record is going to be exposed, whether in a Republican primary or in a general election. I think that's part of democracy. I also think you need to have a level playing field, that, you know, he is a billionaire. But I think it's important. WILL: He is also attacked Kelly Ayotte, the Republican senator from New Hampshire, lots of money, hasn't dented her. KARL: In fact, she's used it against him, right? BRAZILE: But 14 mass shootings, 14 mass shootings since New Town. The families came up to Capitol Hill this week. They met with some of the Republican lawmakers. They're trying to get the dialogue restarted again. And let's see if that happens. KARL: All right, Donna Brazile, thank you, George Will, Congressman Gutierrez, Newt Gingrich. Thank you all for joining us. Thanks everyone. Coming up, father's day in the Bush family. You can see some photos there. And next, the interview with Jeb Bush, a special and surprising conversation about his dad. KARL: Jeb Bush up next, but first, the Sunday funnies. JIMMY FALLON, LATE NIGHT WITH JIMMY FALLON: Hillary Clinton finally joined Twitter yesterday. She racked up more than 200,000 followers in only five hours. Yeah, they were like Hillary in 2016 and Washington needs Hillary, Hillary for the White House. That's not her followers, those were her tweets. KARL: Now our Sunday spotlight. Shining this Father's Day on former Florida governor, Jeb Bush. His dad, the former president, celebrated his 89th birthday on Wednesday. KARL: So your dad just turned 89. KARL: So tell me, what was Father's Day like in the Bush household? BUSH: He's a humble guy. We didn't, like, go celebrate. Every day was Father's Day as far as I was concerned. I don't remember having, like, a celebration of him, ever. It was always about us. So I honestly believe that he's the best dad and the best man I've ever met. KARL: The best man you've ever met? BUSH: Yeah. I've met a lot of people now that I'm 60. So that's a -- I'm not kidding. The guy is unbelievable, and he keeps coming back for more. KARL (voice-over): When it came to disciplining the children, the elder George Bush was a man of few words. BUSH: All my dad had to do was say I'm disappointed. KARL: What would that mean to you, to hear that? BUSH: Well, it happened more than once, and it was devastating. It took a while to shake off. BUSH: I get emotional thinking about it. Oh my God, I screwed up again. KARL: You were with him through some moments of great victory, obviously, from president of the United States, but also some moments of real defeat. BUSH: The '92 one was the most depressing. KARL: That was really hard on you, personally, wasn't it? BUSH: It's painful to watch a person you care for and love, lose. It's just not easy to do. KARL (voice-over): Two years later, it was Jeb who came up short. KARL (voice-over): Losing his first campaign for governor of Florida on the same night his brother, George W., was elected governor of Texas. When you lost in 1994, which also must have been a tough loss for you personally, running for governor, how did he react about it? KARL: It was tougher on him? BUSH: Yes, it was. I think it was. I called him early and said I don't think I'm going to win, sorry. You know, I love you or whatever. He said the same thing. And he was on the elevator going down to the victory celebration where George was announcing his victory. And I ended up learning that losing actually turns out to be pretty good. It makes you better. You learn and grow. And I think my dad's post-presidency, he didn't miss a beat. He did not get into any kind of, oh, woe is me. Dusted himself off and has led an incredible life since 1993. For a guy who has been an incredible leader in every way, he is the most humble man I know. What I have learned through my dad is that humility is perhaps the most powerful tool of leadership that exists. And the world we're in today is focused on self a lot more than in previous times. A little humility would go a long way right now. KARL: He's 89 years old now, his health is failing. How has he taken that? BUSH: I think it was hard at first for my dad to transition to being immobile. I think he's found the right balance. I think he's in a good place. He's mentally alert, he's funny as all get out. He's spiritually in a place that we all should envy. He's more comfortable with his age. And that makes me happy. KARL: Now, your dad is a famous later writer. KARL (voice-over): And this year, to honor their dad's love of reading and writing, the family held a Father's Day letter-writing contest to promote former first lady Barbara Bush's Foundation for Family Literacy. (on camera): What's the idea behind this project? BUSH: The idea is to first get dads and granddads more involved in the process of teaching kids how to read and giving them the joy of reading. There have been some really cool essays. One that I most appreciate is a guy who went through life, his adult life being functionally illiterate, not being able to read. He graduated from high school, college, got a job, was a great photographer, and he ended up writing a letter about the joy of -- the importance of reading, the shame that he felt, and the joy of overcoming that. KARL: So I've got to ask you, your mom, on the issue of whether or not you should run for president famously said you probably shouldn't run, the nation's had enough Bushes. Even though she said you'd be the best person. KARL: What about your dad? Has he offered you any advice? Does he think you should run? BUSH: I think we have got a split ballot amongst the Bush Sr. family. Pretty sure that's the case. KARL: Our thanks to Governor Bush. And you can see more of our interview at abcnews.com/this week. That's all for us today. Thanks for sharing part of your Sunday with us. Check out "World News With David Muir" tonight. And to all those dads out there, including mine watching this morning from Florida, happy Father's Day.